Can I start with a confession? I’m not a very safe biker. Okay, so I’m cautious and careful–I would never do anything truly crazy like jump off a curb or try to race a train at a railroad crossing, but bike safety issues (helmets, lights, bells, hand signals) have never really been my thing. I know, I know! This bike series started because we have this awesome new bike and blog partner (the Yuba Mundo from Yuba Bicycles) that we want to share with you, so you might expect me to be a model bike-safety citizen. But really, I’m more of bike-safety-work-in-progress. For example, today I was riding along and caught a glimpse of myself in the reflection of a window. Then and only then did I realize that my bike helmet was on backwards. Not many people can mess up bike safety as well as I can. Another example: when I asked my three-year-old to help me show people how to safely ride a bike, this is what she gave me. A perfect visualization of how NOT to ride a Yuba. Sigh. With a disclaimer that addresses my ineptitude out of the way, let’s get on to the good stuff. In case you (like me) have tucked away (or forgotten) the things you once learned, let me offer you this (relatively) painless refresher course. 1) We should all love bikes and bikers. Even if two presidential elections have passed since you rode a bike, you should cheer for, respect, accommodate, and bake lovely homemade goodies for your friends and neighbors who use bikes as transportation. Cyclists are making the world a healthier place by cutting back vehicle pollution and burning human fuel instead of fossil fuel. (Don’t even think about sending me a link with stats on how little of a difference one cyclist actually makes. I will plug my ears, say “lalalala,” and remain firmly in the “every little bit helps” camp.) Oh! And one more thing…every bike you pass on the road is one less car you have to fight against during your commute. You’re welcome. 3) Make sure your helmet fits. After my first Yuba post, a friend pointed out that my daughter’s helmet was way too loose to be helpful. Oops! (She wears it much tighter when we ride, but I should have noticed that when we were taking pictures.) “A good fit means level on your head, touching all around, comfortably snug but not tight. The helmet should not move more than about an inch in any direction, and must not pull off no matter how hard you try.” Read more about helmet safety HERE. 4) Wear sunscreen. There are plenty of people who don’t use sunscreen. But most people who skip the SPF lotion protect their skin in other ways–like with hats and sunglasses. The sun is blazing hot this time of year, and I would really like to skip the hassle of sunscreening my girls every time we ride. But this is one issue where I’m a stickler. 5) Wear closed-toe shoes. Here’s another one where I’m hit or miss (but I am getting better!). In the event of an accident, I’ve read that closed-toe shoes could keep you from losing a toe. Ouch! In case you’ve completely forgotten bike hand signals (it’s okay; I understand), I like this visualization. 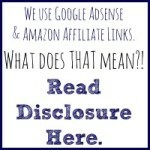 8) Be aware. I have a pretty vivid imagination, and I can vividly imagine a car door swinging as we ride by a parked car and my little family flipping over the handlebars like some slap-stick comedy show. Only without the comedy part. 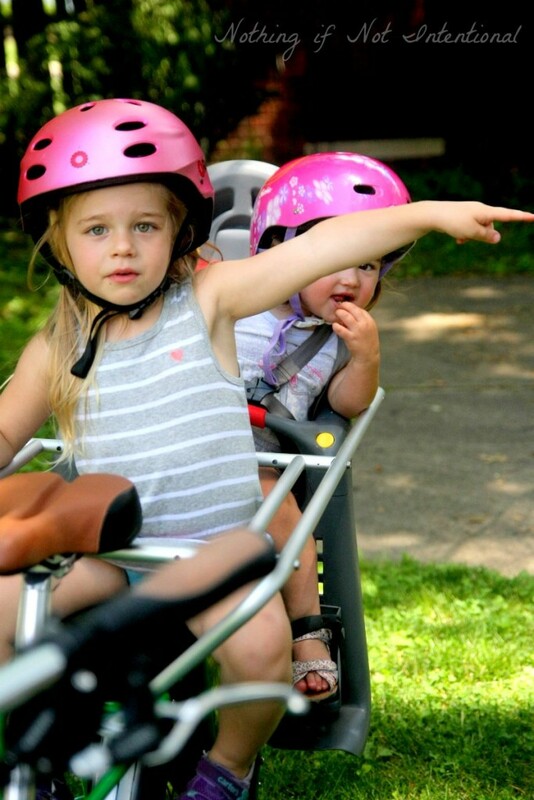 It’s my job as a bike taxi mom to be aware and protect my kids. 9). Advocate for your fellow cyclists. Bikes are traffic. The U.S. government confirms this. The U.S. Department of Transportation says, “Transportation agencies should give the same priority to walking and bicycling as is given to other transportation modes. 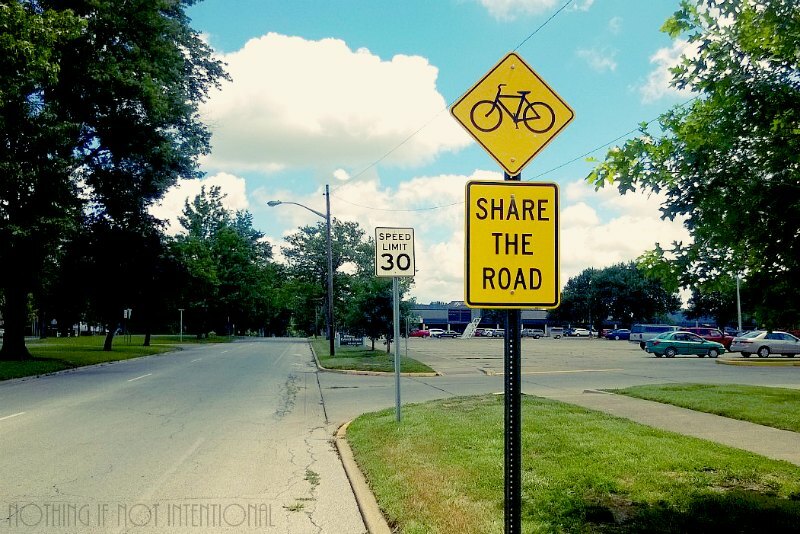 Walking and bicycling should not be an afterthought in roadway design.” Rally with a group like “I Am Traffic” to help make roads safer for cycling families. Wow, so helpful. Thanks for yelling at me like that. In our state, bikes have the same rights and responsibilities as cars. We belong on the street. Don’t squeeze us over into a gravelly median. Don’t fly by so close that we swerve into a ditch. Don’t let your kids reach out the window and grab the leg of a child in a bike seat (it happened to me!). Resist the urge to look at us like we’re the scum of the earth because we’re (much) slower than you. Even if you don’t cycle, please respect those of us that do (see #1). 11) Know your state laws. From what I can tell, there aren’t many cycling rules that apply to all 50 states since traffic is a state/local issue. I live in Indiana. Indiana’s laws aren’t too bad. We have a few things that I think are strange–such as the fact that bike bells are required but helmets are not. To familiarize yourself with your state’s rules, click HERE for the League of American Bicyclist’s state-by-state guide. In Indiana cyclists can not only ride on the road, but we can also have two bikes side-by-side–even in traffic. For my fellow Hoosiers, check out this awesome picture/chart of Indiana’s biking laws and regulations. 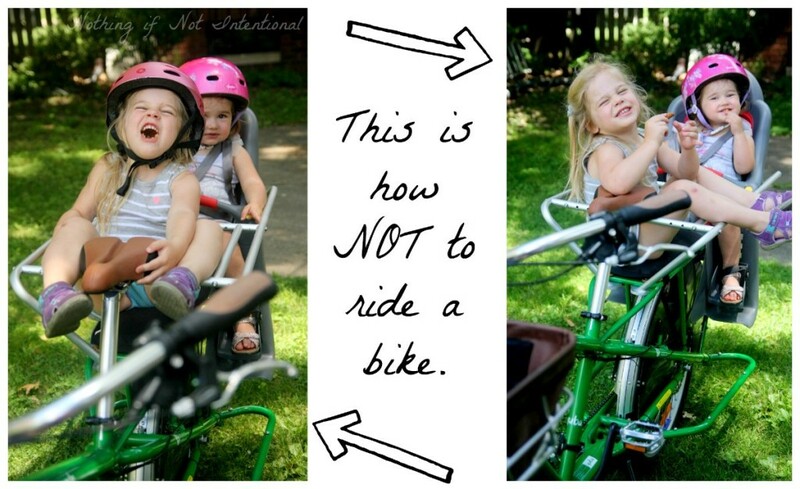 12) Be a good bike model for your little ones. Wanna know why I started wearing a helmet? I was getting questions from my three-year-old! How can I expect her to wear a helmet if I don’t? Okay, friends, fess up! Which bike safety rules do you break? 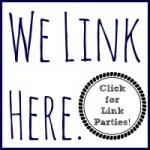 This is the second post in a series brought to you by our blog partner, Yuba Bicycles. Some moms get mini vans; others drive SUVs. I have a Yuba. Not only can it carry three kids (more than my car can carry with car seats! ), but it’s also a much easier and faster ride than our previous bike seat + bike trailer kid-carrying arrangement. 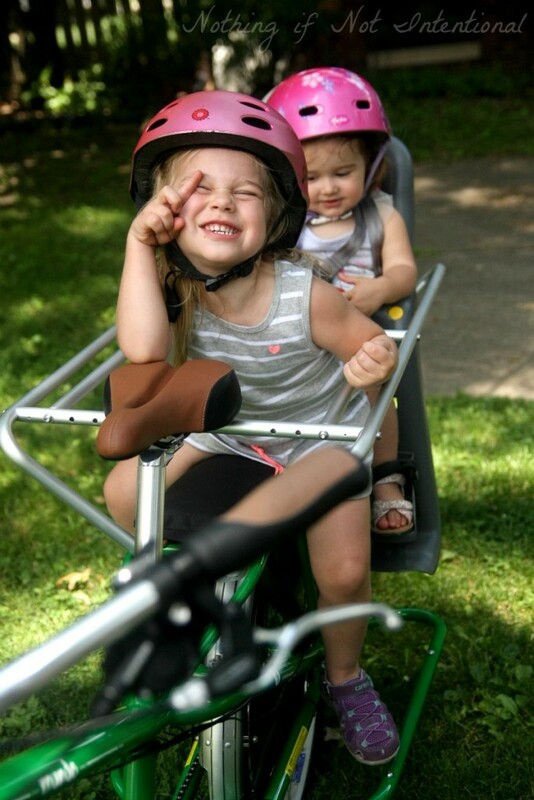 Before you leave, click HERE to see our first bike post: 11 Ways to Make Bike Rides MORE Fun for Kids! 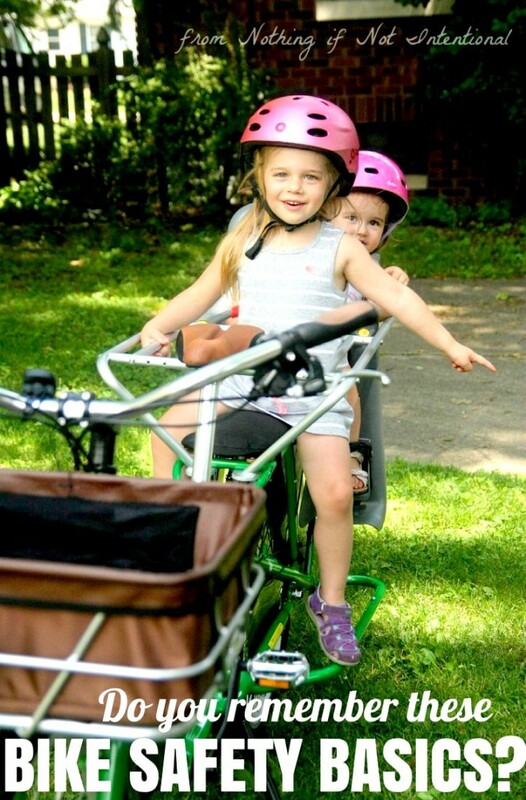 Pingback: The Easiest Way to Teach Your Child How to Ride a Bike!